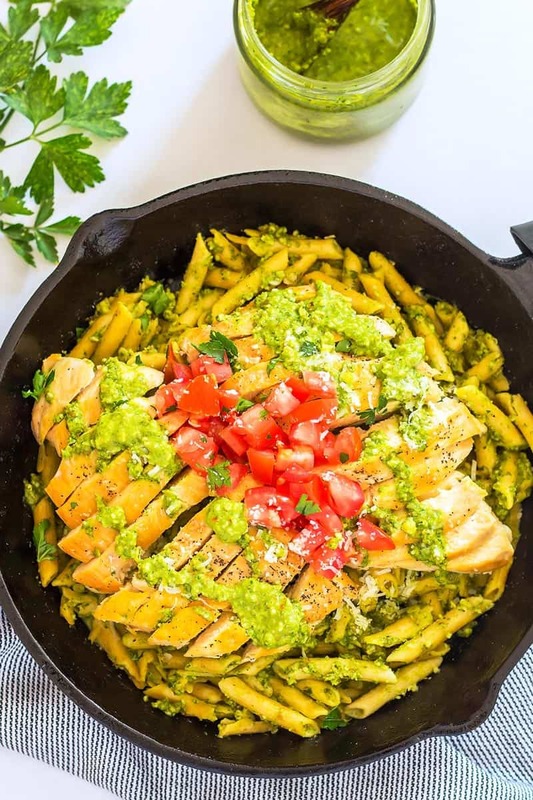 This amazing Pesto Chicken Pasta dish comes together in just 30 minutes which makes it perfect for weeknight dinner. A simple recipe for kale pesto is included but you can also use store-bought pesto to make this meal even quicker. Make it gluten free with Chickapea pasta! This post is kindly sponsored by Chickapea. Their amazing gluten-free pasta is made from just 2 ingredients – chickpeas & lentils! 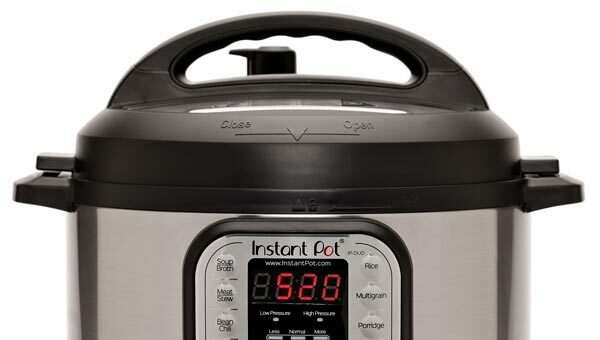 Finally an easy delicious way to make all your favorite pasta dishes gluten free. Pasta has always been one of my favorite comfort foods. Growing up how to boil a pot of pasta was the first thing my mom taught me to do in the kitchen. And suddenly I was in charge of cooking something for my siblings to eat after school. I was super proud about that step into independence. For a long time afterwards pasta was my go-to quick meal to cook. Although later I learned to add some protein and vegetables to the mix for a little more balanced meal. However, when I woke up to feeding my body to nourish it – not just to stop it feel hungry, I realized that my beloved white pasta didn’t have much to offer in terms of nutrition. Add to that that I married someone who didn’t share my love for pasta – he grew up with rice as his staple go-to food. So for a while there pasta rarely happened at our house. Thankfully, spiralized vegetable noodles become trendy not too long later. And then I also discovered the awesome Chickapea pasta alternative! With just the same method as regular pasta and even quicker cooking time, I can now enjoy my beloved Italian pasta sauces again. Chickapea pasta is made from just 2 wholesome ingredients – chickpeas and lentils! So I can feel great feeding myself and my family nourishing noodles. Especially on super busy weeknights nothing beats making quick pasta. This is a vegetarian/vegan pesto without parmesan cheese. It only includes greens, herbs, salt, garlic, lime juice, oil and almonds. Process the first 5 ingredients while slowly pouring in the oil (I like virgin avocado or olive oil). If you are using a food processor, you can pour the oil in the feed tube and it will slowly drizzle through the small hole at the bottom. Add the almonds last and pulse until they are coarsely chopped and incorporated. 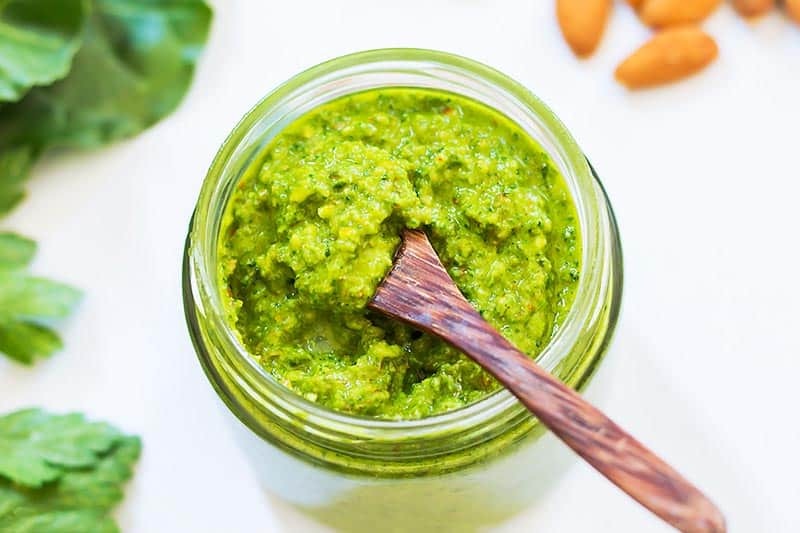 Other than kale, spinach and Swiss chard are great greens to use in this pesto. Just be sure to remove hard stems. What can you do with kale stems? Don’t waste the hard stems of kale or Swiss chard leaves. Use them the next time you make homemade broth (with bones or other vegetable scraps) for a delicious veggie flavor. Making chicken pesto pasta is really simple. It’s one of my favorite meals to cook when we are really short on time. If you are not making the simple pesto recipe from above, store-bought pesto works just as well. Get a pot of salted water boiling and cook the pasta until it is just al dente (it’s important not to overcook it). Be sure to reserve about 1/2 cup of the pasta water. This is my trick for making creamy pesto chicken pasta without cream. In a skillet on low heat toss the cooked pasta with the pesto and pasta water. The starchy water helps to turn the pesto into a creamy sauce consistency that perfectly coats and clings to every single noodle. To cook the chicken for the pesto chicken penne you need a nice and hot skillet. Season the chicken breasts with salt and drizzle a little oil to the skillet before adding the chicken breasts. I let them cook for about 6-10 minutes per side without moving them around much. You can use that hands-off time to prepare the pesto and pasta as explained above. Pepper the chicken breasts after flipping. The chicken is done once the internal temperature reaches 165°F/75°C (an instant read thermometer is really handy for that). Next, be sure to let the chicken breasts rest on a cutting board for 5 minutes before slicing them up and adding on top of the pesto pasta. 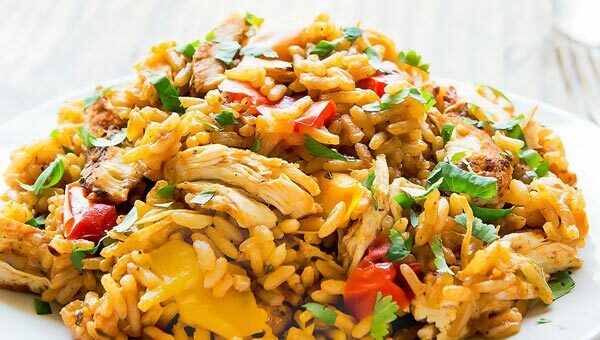 You could just omit the chicken and still have a decent protein-filled meal. Chickapea pasta includes 15 grams of protein per 2 ounce serving. But to make it a little more interesting you could sauté mushrooms, broccoli, asparagus or any other (protein-rich) vegetable that you prefer and toss it with the pesto pasta. 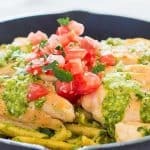 I love serving this chicken pesto pasta with tomatoes. I simply dice up some roma tomatoes and add them on top. But cherry tomatoes or even sun-dried tomatoes are a great option as well. You can serve this easy pesto pasta many different ways: hot for dinner, it reheats well as meal-prep lunch, or serve it cold for your next potluck as chicken pesto pasta salad! I used Chickapea penne. You can order it from their website or use their storefinder to find a retail store near you. Or simply include some with your next Amazon order. 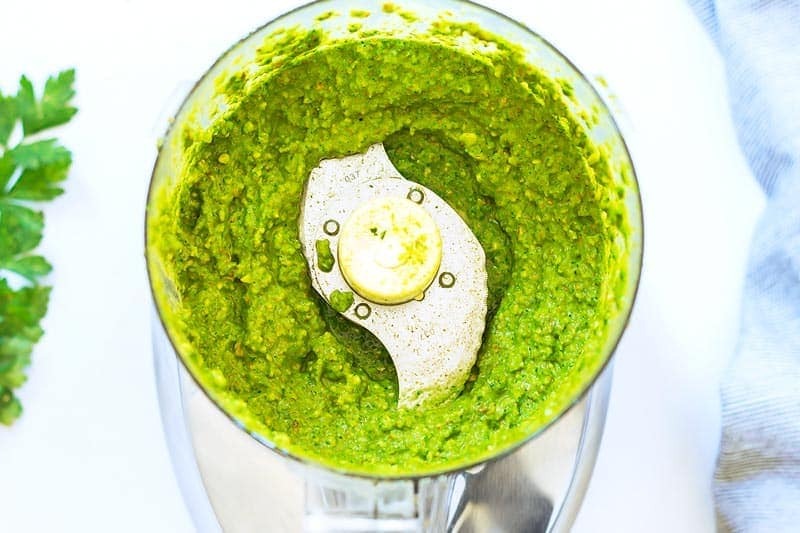 My food processor is near and dear to my heart to quickly whip up pesto (among so many other things). And finally, a Lodge L8SK3 10-1/4-Inch Pre-Seasoned Skillet is amazing to give the chicken breasts a perfectly seared outside. I use a silicone sleeve for the handle. Place greens (hard stems removed), herbs, salt, garlic and lemon juice in a food processor. Turn on and slowly pour in oil while machine is running. Add almonds and pulse until coarsely chopped. Set pesto aside. Bring a large pot of salted water to a boil and cook the Chickapea penne until al dente. Reserve about ½ cup (125ml) of the pasta water, then drain the pasta. Heat a skillet to medium-high heat then drizzle with a tablespoon of oil. Season the chicken breasts with salt, then place in the hot skillet. Turn heat to medium. Cook the chicken breasts for about 6-10 minutes per side. Once flipped season with black pepper. The chicken breasts are done when the internal temperature reaches 165°F/75°C. Set them aside on a cutting board to rest for a 5 minutes before slicing. Add the drained pasta to the same skillet on low heat. Pour in some of the reserved pasta water as well as ¾ cup (180ml) of the pesto. Toss gentle to combine until all the penne is nicely coated in pesto. Top with sliced chicken, more pesto, diced tomato, parsley and parmesan. Serve hot or cold as pesto chicken pasta salad. 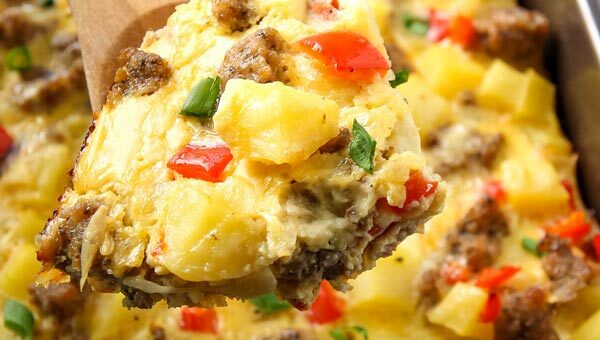 This is a delicious looking recipe and you provided a lot of different options to change it up. Yum! This looks very yum! A whole hearty meal for the family. The recipe is so rich in fibers, and the garnish of cheese and tomato makes it all a perfect 10! Thank you for your kind words Ushmana! Kind greetings back from Mexico! Pasta has always been a quick and easy go to meal for me too! I love how versatile it is and really love what you did with the chickpea pasta here! Pesto is the best! I love that you added the tomato on top! I love fresh tomatoes and am always adding them to things. This pesto looks incredible. And check out the protein content! I think I’d just leave the chicken off and enjoy a quick pasta meal! 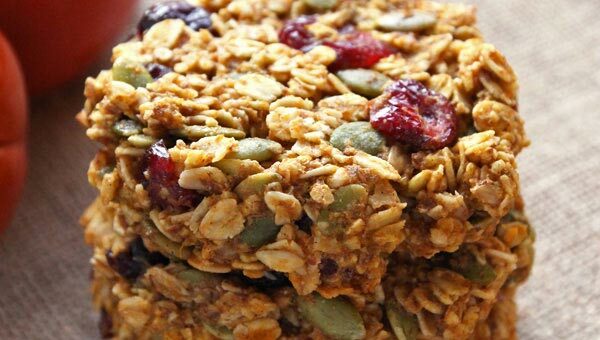 This is a truly amazing recipe! I make pasta with kale pesto very often (usually with cashews). I cannot wait to try your version, Regina! Plus, the delicious and healthy Chickapea pasta, make me crave this even more! 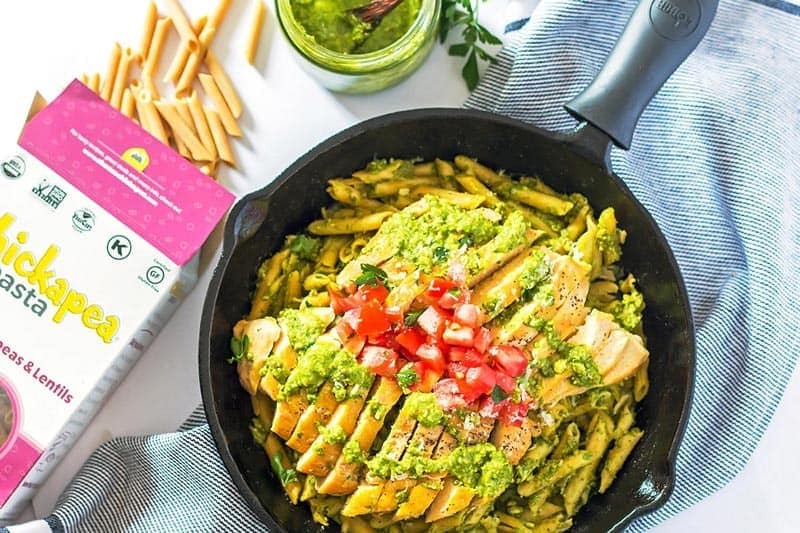 I’ve needed a good vegan pesto like, forever and I am soo soooooo excited to try this crazy colorful chickapea pasta dish! love it! Yum! This recipe looks so yummy. Love the Chickapea Pasta and Pesto combination. It’s such a no-brainer recipe! Put pesto on anything and I’m a happy girl! This looks amazing! 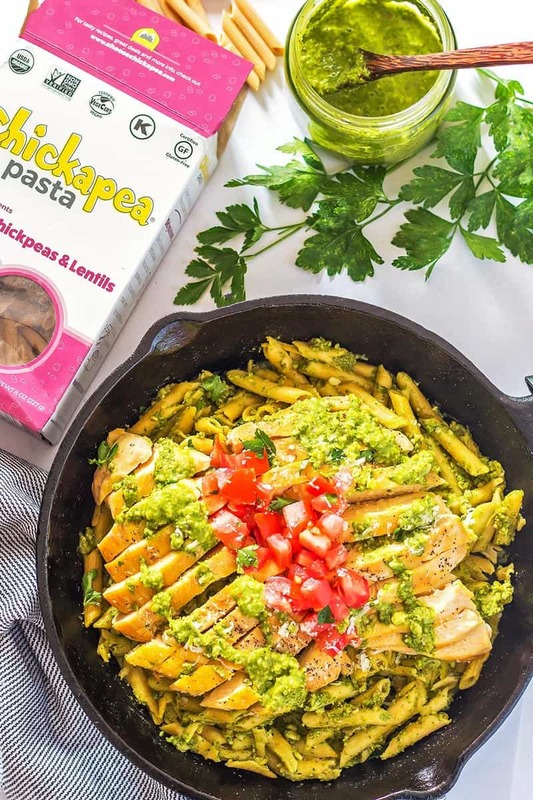 I was so thrilled to find Chickapea pasta because it’s such a healthier alternative and my kids love it even more than regular pasta! 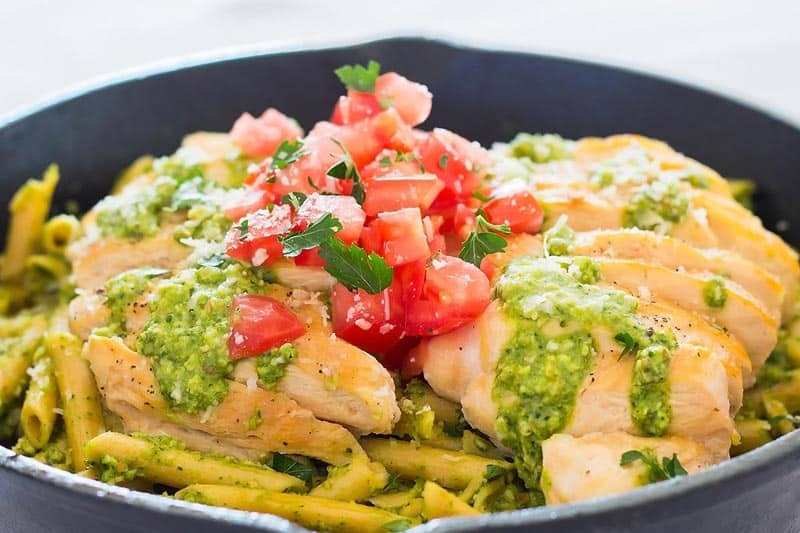 Pesto chicken is one of our favorites here, so I want to dig right into this! Isn’t it such a great way to make sure to have greens in a meal? Loving this bright, beautiful dish. So much needed protein and lots of complimentary flavors. Simply delicious! Thanks so much for your kind words Robyn! This recipe is incredible! 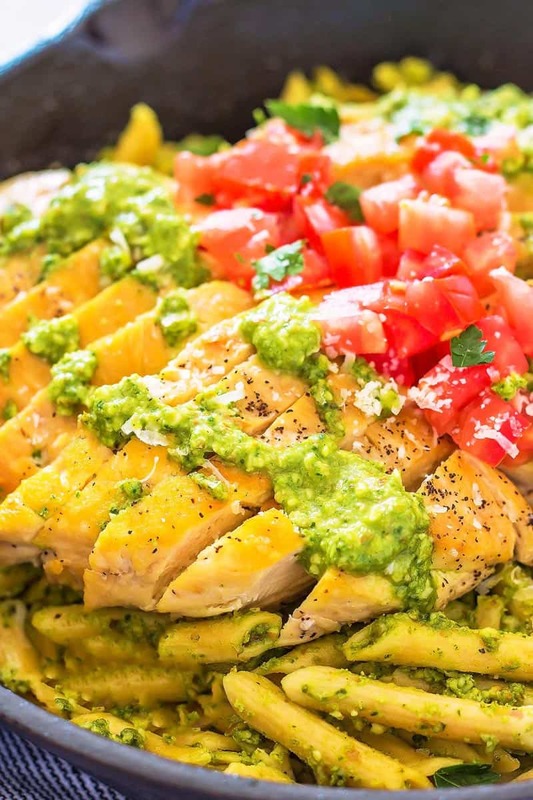 The Chickapea Pasta is perfect with the chicken and pesto. Love it! It’s such an easy recipe – we have it all the time!